MacStories is also a good site for shortcuts/workflow information in general. If you don't want to use the Shortcut, you can do it with this app, or check several sites online that do it. Why would you not want to use a shortcut? Ware you get the red border? Last edited by jonny247; 11-10-2018 at 05:11 PM. The red border for the Plus size iPhones came from @heyeased on his website. Same as those for the X and XS Max. I had to alter the homescreen a bit though, to fit it like I wanted it. If you use the free version of Tailor to stitch screenshots, this Shortcut removes the watermark at the bottom. So, perhaps this is way to simple, can I set up shortcuts to just launch apps like Launch Center Pro? I was just trying to create an shortcut to launch an app but couldn't see how this was done easily. Thanks. I should have figured that out. Guess I didn't search for app when I should have. I don't see how this is any shorter than just tapping the desired app icon. I've created a shortcut to perform some actions followed by placing a call, and put an icon on my home screen to run the shortcut. I did end the shortcut with an Exit Shortcut action after the Call, but I'm not sure whether this is needed at the end of the shortcut or not. When I run the shortcut from the home screen, everything works and the call is placed, but when I end the call I am left on the Library page of the Shortcuts app. Is that normal? I would really prefer to be left on the home screen where I tapped the shortcut icon. I'm not the person who asked for this, but imagine instead that you want to turn on Do Not Disturb and then open your podcast app, so that the phone will not interrupt as you are listening with notifications. Or something like that. Easily done with a shortcut. Last edited by ThePinkChameleon; 11-28-2018 at 02:04 PM. I have read a lot of this thread and have yet to understand why I should need Shortcuts at all !! Perhaps someone can point me to an article which can explain to an older man whose eyesight is no longer good and who has two hands full of large thumbs,why exactly he needs to super-complicate an operating system that is already complicated enough ! If you need help with a shortcut, then post the iCloud link so we can take a look. As for why do you need shortcuts? You don't, but I have automated my life with them and can't stop. For example, I have one that I run first thing in the morning that turns off DND, sets my volume low, runs a script to set specific reminders to keep me on schedule in the morning, then opens my meditation app to my current meditation. then later in the morning I run one that gets the weather, my schedule, top news headlines, birthdays and sends a birthday wish, the NFL scores/ upcoming games and then asks if I want to see the following days schedule. then when I am ready to drive to work, I have one that determines the time it will take to get to the office, asks if I want podcasts, music or an audio book, then opens nav ready for me to go. after work I have one that sends my wife my ETA home, sends her a random love message, asks what audio I want for the ride and sets up Nav. Then right before bed, I have one that sets DND, gets me the forecast for the next day, runs my goodnight HomeKit scene to close up the house, then opens my sleep meditation. So in the end it saves me lots and lots of steps. I also have over 100 other shortcuts that I use but, I have issues and can't stop writing new ones. Last edited by bamf-hacker; 11-27-2018 at 02:21 PM. No one needs shortcuts but I find them as a means of doing daily routines as well as a way to customize my device. I believe shortcuts are in its Infancy and learning the basics now will help prepare us for the real reason Apple paid what they did for Workflow. I personally don't like having lots of folders with different apps, nor do I wants lots of screen to swipe through. I also like my home screen to have fewer app icons so I can see pictures of my boy. I could create a second screen with one app to view the whole picture, but the home screen could be improved that way. Shortcut allow me two taps to get to any app. Much better. I could swip down and then type, but it's not the greatest thing. Not uncommon to have the keyboard not appear or I don't type correctly. I don't know if it works on the X style iPhones, but on my 6s Plus, I can leave the first screen empty and put icons on the 2nd, 3rd and etc screens. Have you tried that? Ya. I have. Right now, I have two rows of apps on my first screen, then the folder stuff on a second screen. I mess around with my home screen some just to see other ways that might work better. Similar issues though. Scrolling to the right to find an app, or digging into a folder and then having to screen in the folder. 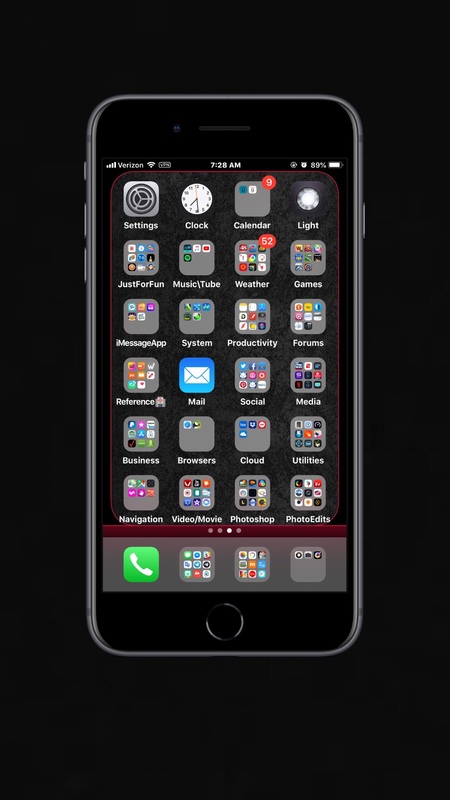 Still would have to search the same way via home screen pulling down. Keyboard doesn't always come up. My wife has like 6 screens full of apps. Drives me crazy but it works for her, so that's fine. Here is one I will share for all of you to send your New Years texts. Let’s you send a bulk text to the contacts you select and if you have a nickname for the contact it lets you use that for the greeting. I wish I saw this earlier! Last edited by jonny247; 01-27-2019 at 10:28 AM.